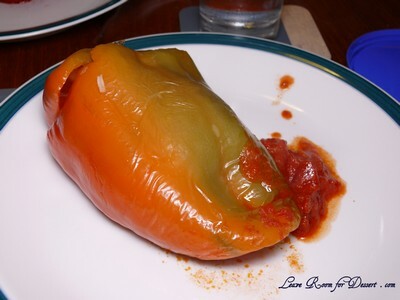 Our third family cooking class was a lovely stuffed capsicum dish, with a rice, lamb, onion, tomato and spice stuffing in capsicums which had been boiled in salted water (a step I had never done before) then cooked on the stove (another step I hadn’t done – I’ve always cooked them in the oven) in diced tomatoes and lemon juice. It may have taken a bit longer than we had expected, as it often takes a while to figure out what you’re meant to be doing from the recipe and trying to make sure everyone gets a go. They are relatively easy though, even though I mentioned it took a while, especially if you have made the rice or filling beforehand. 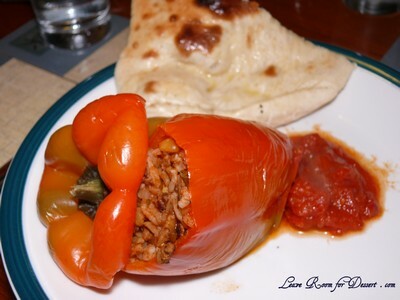 I’m sure for those who do not want or are unable to get lamb mince, that you could substitute it with beef mince or a vegetable filling of mushrooms, eggplant etc and it would still taste fantastic! Nonetheless, once you’ve got these capsicums in and cooking, there is plenty of time to make naan bread and/or clean up from the preparation. Cut the tops off the capsicums, remove seeds and core. If the capsicums are going to fall over, trim a little off the bottom, so they stand. Cook in boiling salted water for 5 minutes, then drain, rinse under cold water and set aside. Place the split peas in a saucepan and cover with water. Bring to the boil, then cook on medium heat for 15-20 minutes, until soft. Drain. Heat the oil in a large saucepan and cook onion and spring onions until golden brown. Add the garlic and lamb and cook over medium heat until well browned. Stir in split peas, cooked rice, herbs, cinnamon, juice of lemon and tomato puree into the meat mixture. Stir to combine, then stuff into the capsicums. Place capsicum lids on top. Place chopped tomatoes, butter and juice of one lemon into a large saucepan. Place capsicums on top of tomato mix with stems upwards. 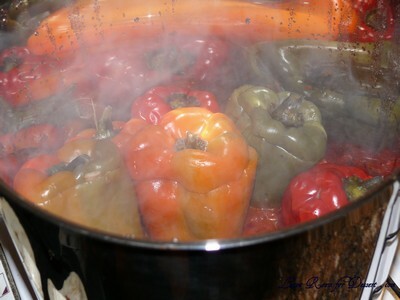 Bring to boil, cover with lid and cook on low/medium for 40-45minutes until peppers are tender. 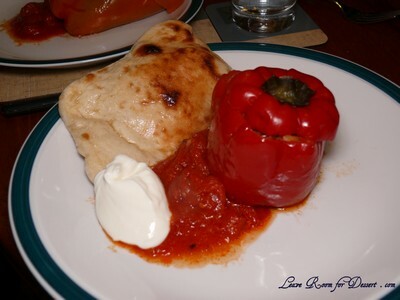 Serve with the tomato mixture, yoghurt and naan bread. 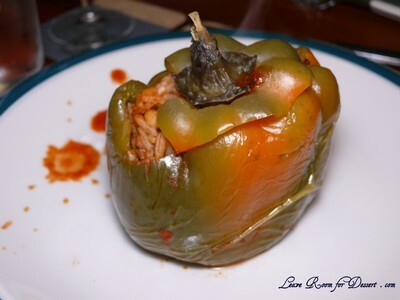 ohh I loved stuffed veggies…stuffed tomatoes…peppers…eggplant…it’s all good! Oooh, I love these. 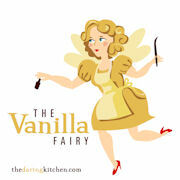 Your version looks especially delicious, can’t wait to try it. Sounds so fabulous and looks just as tasty, I would love to try some for sure. Hi Audax – Thanks! 😛 This method is quite similar, with the addition of boiling the capsicums. Hi Lorraine – No worries, I hope you enjoy it, it would work well with the weather in Sydney at the moment. Hi Sara – Thanks, it is a good version and easy to change if you are missing any ingredients. Hope you like it. 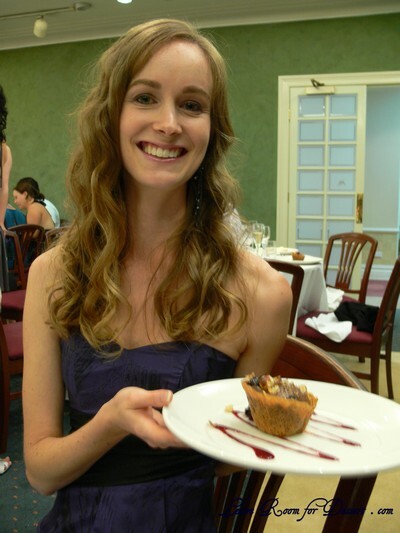 Hi Jeena – Thanks, hope you like them if you try them! oh yum. 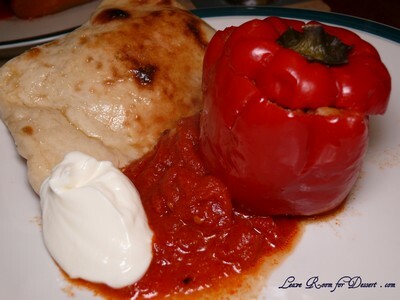 Stuffed capsicums are always great, and you can stuff them with whatever is left in the fridge!